How is it possible to have jet lag from a two-hour time difference? This and other scintillating questions will not be answered in this post. I may be tired because the day after I got home, I was back in the circus studio rehearsing 'A Call to Arms' (yes, that is the title chosen by our director) on the fabrics for three hours. Here is the thing about fabrics strung from the ceiling on which one is meant to dance: they don't always cooperate the way you would like. As our director says, they are the silent partner...who sometimes throws a moody. But you have to just go with it, smile, and pretend to be entertained by static cling. Ready or not, the show is next week. But I have to say, just being in the show is huge validation for the article I wrote a while back for Dancer's Voice. And I was able to procure a copy of said article when I rendezvoused with my sister who is the editorial director. I would publish a link here, but unfortunately it's not published online yet, and it's in Spanish. I can publish a photo I took of the article, and tell you that the title is roughly translated: "There is No Disability in Dance." I was born a dancer. I have high arches and a disarmingly natural turnout. When I was eight years old, my mother enrolled me in a beginning ballet class––a room full of little girls with top knots, in leotards and light pink slippers. I liked leaping across the linoleum floor. My teacher said I was a natural. I was born with one tiny arm, seven inches long, with three webbed fingers. The doctors said they didn’t know why, but I would be that way for life. So, my leotards always had short sleeves. I wanted to dance in high school, but my spine decided to curve in several places. So instead, I wore a brace eighteen hours a day for three years––hard plastic cinched around my middle, unbendable from waist to neck, kept me out of dance class. But in my last year in school, I took the brace off, and signed up for tap and modern. I choreographed a modern piece with three girlfriends for the yearly recital. I contorted over backward, twisting right along with my spine. “You are really flexible,” my teacher said. But I went off to college, leaving dance behind. Finished with school, I plunged into work at a computer, behind a desk. But one day, a woman came to my desk and asked if I wanted to dance on the back of a moving horse. The first time I tried equestrian vaulting, I was coached by a man who also had one arm. It seemed fate had intervened. “You know you’re an athlete, right?” he said. And I believed him. At twenty-six, with one arm and a twisted spine, I quit my job and moved to California for “horse dancing” with my one-armed coach. “Vaulting is for everyone,” he said. One third of his students had a disability. For one glorious summer month, I felt more alive than I ever had. But dogged by a mysterious illness, energy sapped, and more and more feverish every day, I felt my happiness slipping away. I had the desire, drive, and talent, but not the ability. It was infuriating. If I was born to dance, why was I hitting obstacles at every turn? Several years later, I went to see a visiting dance company from Mozambique. Half of the dancers were physically handicapped. One woman had lost both of her legs, but it was her performance that was most riveting––she danced with her voice and her arms. “We don’t think of ourselves as a disability dance company; we’re just dancers,” the director said. 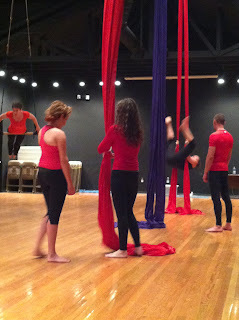 Last year, a friend invited me to an aerial fabrics class. She might as well have offered coke to a recovering addict. 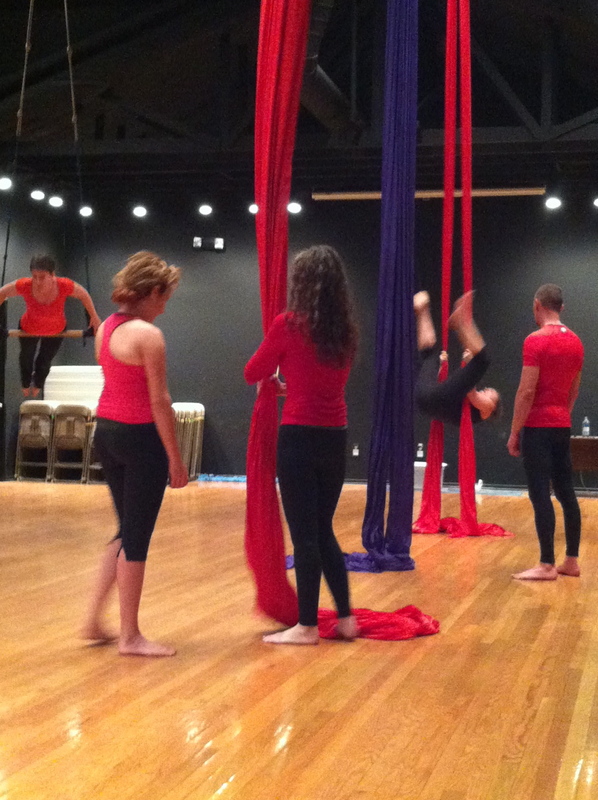 Climbing onto the silks was like dancing in air. Hanging by my waist, I released the fabric and I let my torso fall backward in an arc, the momentum swinging me out in a gentle circle, my fingers caressing the linoleum. Freedom. Strength. Beauty. Yes, I was meant for this. After twenty years of being a frustrated dancer, I’m finally learning how to dance. I’m learning that dance is not about making it, but what you make of it. If I can’t do something, I’m learning to ask what I can do. The forms I choose are obscure in the dance world, even challenging the definition, but so am I. There are as many ways to create beauty through movement as there are shapes of people. No arms, no legs, no space––dancers just keep dancing.